Martin Brodeur is one of the game’s greatest goalies, a guaranteed Hall of Famer who can now add another distinguished honour to his long list of accomplishments: gracing the cover of the EA Sports’ NHL 14 video game. The contest to see what player would be featured on the cover started on April 22, with 60 NHL players (2 players per team) facing off in a single-elimination vote with two players in each match-up. NHLPA members took to social media to state their case as to why they or their teammates should be selected as the winner. Fans also fought hard for their favourite players by creating videos and images in support of their favourite players. After several rounds and many close votes, it was Brodeur who emerged as the winner, narrowly defeating fellow backstopper and 2013 Vezina Trophy winner Sergei Bobrovsky, for the honour of being immortalized on the popular video game cover. A three-time Stanley Cup winner, a two-time Olympic gold medal recipient, a four-time Vezina Trophy winner, a five-time Jennings Trophy winner, a 10-time NHL All-Star and a Calder Memorial Trophy winner, Brodeur is thrilled to add one more accolade to an already outstanding career. He’s also embracing his chance to connect with fans and teammates on Twitter, a platform he used to good effect throughout the EA Sports contest. During the campaign, both Brodeur and Bobrovsky took over the @NHLPA Twitter account on the same day, for a back-to-back question and answer session with fans. He knows those closest to him felt the same way, too. Now, Brodeur can enjoy the game with his kids in a unique way. Perhaps. 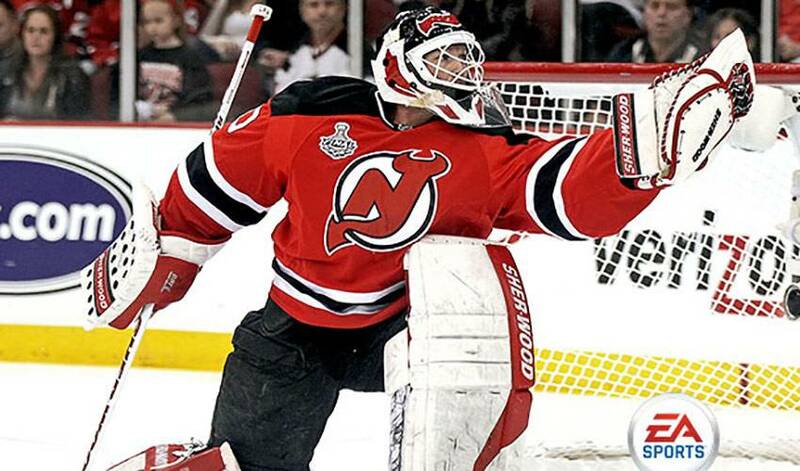 But when it comes to winning, either on the ice or for the EA Sports NHL 14 cover, Martin Brodeur is hard to beat. NHL 14 will mark the first time since NHL 97 that a goaltender is featured on the cover. John Vanbiesbrouck was on the cover that year.